The first judicial victim of the Abramoff scandal gets jail time. A federal judge sentenced a former Bush administration official to 18 months in prison in the Jack Abramoff lobbying case Friday — after delivering a 30-minute eulogy for good government in Washington. David Safavian, the former chief of staff for the General Services Administration, was sentenced on obstruction and concealment charges for lying to investigators about his relationship with Abramoff. 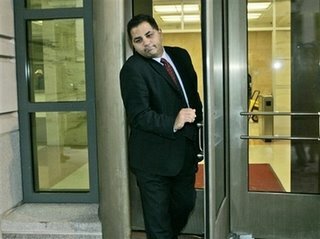 Safavian wept in court as he asked for leniency, but Friedman said the ex-bureaucrat had become part of Washington’s culture of corruption, where congressmen listen to campaign donors and lobbyists while farming out to staff members the job of writing laws. Abramoff, the once-powerful lobbyist, shook Pennsylvania Avenue from the Capitol to the White House when he pleaded guilty to corruption in January and began cooperating with an FBI investigation. The Justice Department and FBI are just getting warmed up. They got Bob Ney to plead guilty, and they gave Abramoff a desk at the FBI because he is cooperating so much (and presumably dishing out the dirt on anything and anybody he had dealings with). The Abramoff story is not over by a long shot. Safavian was small-time, the feds are still going after the big fish.